This recipe is from the Better Homes and Gardens “Old Fashioned Home Baking” from 1990. Be sure you use a full-sugar, old-fashioned jam for this recipe; anything else, like "mostly fruit" types of spreads will simply sink to the bottom. Grease 13 x 9" baking pan; set aside. In a large mixing bowl, beat cream cheese and butter with electric mixer on medium speed about 30 seconds, or till combined. Add HALF of the flour to the cream cheese mixture. Then add the sugar, eggs, milk, baking powder, baking soda and vanilla. Beat on low speed till thoroughly combined, scraping the sides of the bowl. Beat on medium speed for 2 minutes. Then beat in remaining flour on low speed JUST TILL COMBINED. Spread batter evenly in the prepared pan. Dollop preserves in about 8 small spoonfuls on top of the batter. Using a table knife, gently swirl the preserves just a little to create a marbled effect. Bake in 350° for 30-35 minutes Until a wooden toothpick inserted near the center comes out clean. Cool in the pan on a wire rack for 15 minutes. 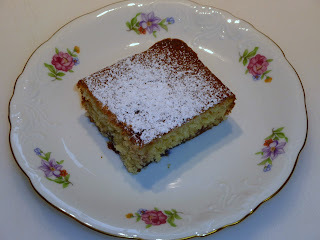 Sift powdered sugar over the top; cut into squares and serve warm or cooled. Per Serving : 313 Calories; 15g Fat (43.7% calories from fat); 5g Protein; 40g Carbohydrate; 1g Dietary Fiber; 77mg Cholesterol; 247mg Sodium. Exchanges: 1 Grain(Starch); 1/2 Lean Meat; 0 Non-Fat Milk; 3 Fat; 1 1/2 Other Carbohydrates.